I am pleased to announce that a volume to which I have contributed, The Reception of Vatican II, edited by Matthew Lamb and Matthew Levering, has been published this week by Oxford University Press. This book, a sequel to Lamb and Levering’s previous volume Vatican II: Renewal within Tradition, is a “Vatican II after 50 years” project, looking at how the 16 conciliar documents have been received–interpreted and implemented–over the past five decades. 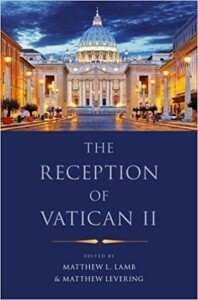 It is thus a milestone work that helps us to see what impact Vatican II has had on the Church (retrospect) and how it ought to continue to be received as our century progresses (prospect).